The space occupied by the goods and the equipment on which they are stored. The aisles between the goods, for direct access to the goods. Distance from the wall to the goods. The space for the goods and any storage equipment will be determined by the characteristics of the product and the volume to be stored for all the goods which are not palletized. For goods which are palletized, the dimensions of the pallet will be the base factor, when goods are stored within perimeter of the pallet. 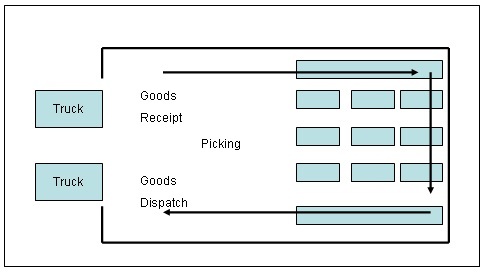 If the goods overlap the pallet, the dimensions will apply to the area occupied by the goods. The width of the aisle depends on the use of equipment in the bulk storage area and the method of operations which is used, manually or using handling equipment. If handling equipment will be used, the turning circle of the equipment being used to access the goods must be taken into account. The turning circle or aisle width can normally be obtained from the equipment manufacturer. 2. Sizing the goods receipt area. No specific formula that can be applied to planning this area. Type and size of vehicles to be handled will determine whether loading docks will be required and this will have an impact on the size of the receiving area. Space requirement for marshalling, sorting and quality control need to be calculated with reference to the planned number of loads to be handled in any day. More space might be required for quality inspection or testing of goods, also we have to consider that goods which are still under inspection cannot be stored pending the result before release it to bulk storage. Equipment needed to handle the goods will be determined by product characteristics and unit load characteristics. The size of the goods receipt area will also be influenced by the working methods. If goods are unloaded and moved straight to storage, a much smaller area will be required rather than if goods are held in the goods receipt area prior to move to storage. Also there is a possibility to use the same space for both unloading and loading. The advantage of this layout is greater flexibility in the use of people and equipment also reduction in the total space required in the warehouse. The disadvantage is the increase risk of congestion if loading and unloading activities should be done at the same time. 3. Sizing the goods dispatch area. No specific formula that can be applied to planning this area. Almost the same with receipt area, type and size of vehicle to be loaded will determine whether docks will be required and this will impact on the size of the dispatch area. Space requirement for marshalling and checking need to be calculated with reference to the planned number of loads to be handled in daily basis. Product characteristics and unit load characteristics will determine the type of equipment needed to handle the goods. Adequate space needs to be provided to allow this equipment to operate correctly. The size of the dispatch area will also be influenced by the working methods. If goods are picked and moved straight to the vehicle, a much smaller area will be required rather than if goods are held in a pre-marshalling area prior to loading. 4. Sizing the picking / sorting area. If the goods are to be received must be selected or sorted before storing then the sorting area should be taken into account. If separate picking area is envisaged, the number of items to be picked will determine the size of the pick-face. The picking method to be used must be considered, i.e. high level, low level etc. Also chosen picking path will influence the aisle width that will be needed. If assembly of goods picked using line or zone picking methods is required, this will require a suitable area to be provided. If a kitting/repacking operation is required, extra space should be planned for this activity. The objective of defining the flow and layout in the warehouse facility is to optimize the efficiency of the flow of goods through the different operations. Wherever possible the objective to arrange flow of goods and layout is to achieve a smooth continuous movement through the process and to minimize the travel distance from one stage to the next. 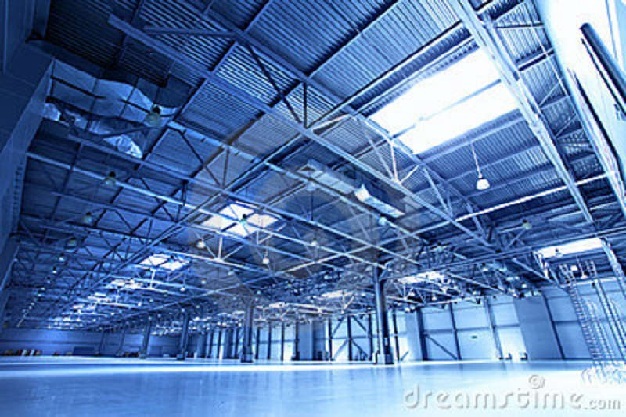 The level to which this can be achieved will be directly related to the design, size and shape of the warehouse. The two preferred options which best meet the requirements of the objectives stated above are “through-flow” and “u-flow”. Because the receipt and dispatch areas are side by side, the space can be used flexibly, particularly if these activities are scheduled to take place at different times in the working day. This can save space overall. Similarly, personnel and equipment can be used in a flexibly way, reducing the requirement for resources overall. Because the main access to the building is in one place, access and security are easier to manage. The building may be extended on the three sides where this is required and where the site allows.